I would like to thank Leaf It With Us for the samples to make this blog post possible. We come from families where tea-drinking is both a ritual and a tradition. We drink tea in the mornings, afternoons and gather for a nice cup of tea in the evenings with our families. Then our own family was born and we wanted to make sure this tradition was passed on to our son – Nathan. However, our aim is to serve him only the best quality tea possible. After realising it was hard to find such teas in Ireland we decided to source them ourselves. We enjoyed our newly sourced teas, as did everyone who visited us for a cuppa. Our families and friends were always asking us for some of our teas and to maybe source some for them – and that’s how LEAF IT WITH US was born. Our main goal is to build a community of tea lovers where people can meet over a cup, and share their ideas, recipes and passion for quality tea. Side note – The straw cushioned the teas and lets them breathe more than bubble wrap. The box is also strong and well suited. Opening the packet I am met with a chocolate and berry, sour mix that’s thick like velvet. Steeping Parameters: 1 teaspoon of leaf in boiling water for 3-5 minutes. Once steeped the tea fills my nostrils with a wonderful chocolate scent, similar to that of it’s raw form. The first few sips reveal a sour cocoa start that leads to a dry yet sweet, berry after taste. It’s not unlike a dark chocolate covered dried strawberry. Further sips lead to a dryer after taste and the mix of sour and sweet combines into one big muddle. Not as definable as it was before, you forget which element was sweet and which sour. A nice blend that could easily be uplifted with honey or sweetener. Opening the packet I am met with sweet citrus orange with a creamy undertone. Reminds me of orange sherbet. Steeping Parameters: 1 teaspoon in boiling water for 10 minutes. Once steeped the tea bares a sweet yet herbal citrus scent, similar to lemon grass. The first few sips reveal a sweet yet light and somewhat creamy citrus flavour that lingers in the after taste. Also has a herbal flavour, but remains fresh with only a touch of dryness. Further sips leave a refreshing after taste which also reminds me of lemongrass, despite it not being an ingredient. I believe the verbana and orange have melded together to mimic it. Opening the packet I am met with a sweet yet herbal scent, with a tropical fruit under tone. Steeping Instructions: 1 teaspoon in boiling water for 10 minutes. Once steeped this tea bares a fruity punch with a herbal, Rooibos after scent. The first few sips reveals a Rooibos heavy blend with some dryness and a mixed fruit after taste that quickly diminishes. Pineapple is definitely the most dominant flavour on the fruit side, though overall it’s still rather subtle. This was more of a Rooibos tea with fruit than a fruit tea with Rooibos, and for me it was too Rooibos heavy. If the fruit was stronger it may have balanced it better but this is not for me. I would recommend it to anyone that likes Rooibos though. As I open the packet I am met with a sweet yet tart fruit scent, particularly apple and berries with vanilla. Steeping Parameters: 1 teaspoon in boiling water for 10-12 minutes. Once steeped this tea bares a sweet, strawberry/cherry like scent though mild. The first few sips reveal a soft yet tart rose hip flavour with a perfumed mixed fruit after taste. It tastes artificial which is why I said perfumed, though I saw chunks of fruit in the blend. I think the sweetness is throwing me, it seems sweeter than it should be; almost like stevia. Perhaps the bourbon vanilla? Further sips bring out the creaminess and the fruit melds together a little better. There was nothing wrong with the blend but again I’m not sure this one is for me. I would have liked stronger fruit and less vanilla. Sweetness is not something I usually add to my tisanes. As I open the packet I am met with a sweet yet nutty and spicy scent. Once steeped the tea bares a sweet yet strong cinnamon scent. The first few sips reveal a nutty almond flavour with a spicy, cinnamon after taste that has some dryness. A nice balance and somewhat masking of the Rooibos flavour. Further sips reveal some sweetness though remains to be consistent in flavours and strength. As I open the packet I am met with a herbal scent, somewhat refreshing yet dry, with a citrus tang. Once steeped I am met with a sweet and crisp lemongrass scent. 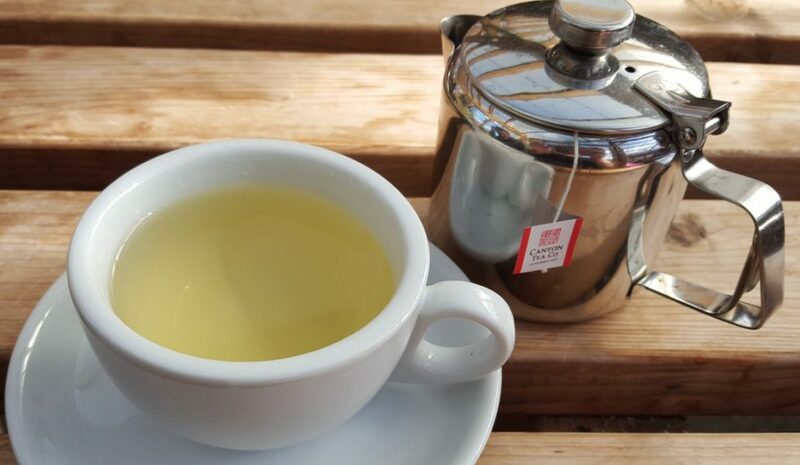 The first few sips reveal a mellow and gulp-able lemongrass zest that trickles like silk down the throat, coating my mouth with warmth and a smile. As it cools the verbana adds a creamy touch and the lavender is a little thicker. I want to add a side note on the lavender – usually I find it extremely soapy or unpalatable. Not the case here, it’s there but in the back and blended very well! Thank you to Leaf It With Us for this wonderful collection of samples. With such wonderful names and blends I will certainly be keeping an eye on you.